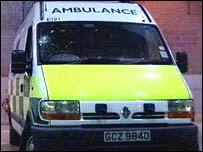 Paramedics were forced to abandon a 999 call in Londonderry after a wheel came loose in an ambulance. The incident happened at Northland Road in the city at about 0147 BST on Thursday. The ambulance driver said he heard a rattle at the back of the vehicle and called control, who sent a mechanic and another ambulance to get the patient. When the mechanic arrived and attempted to drive the vehicle back to the garage, the double wheel came off. The Northern Ireland Ambulance Service has asked for a report into the incident and said A&E vehicles are serviced every 12,000 miles. In a statement it said the broken down ambulance had been serviced in March 2007 and had covered 10,000 miles since then. "The response to the call, which was neither life threatening nor serious, was within targets set and at no time was the patient's welfare endangered," it said. John Kay from the ambulance service union UNISON said it was lucky that no-one was killed. "It doesn't bear thinking about," he said. "If that wheel had come off at any sort of a high speed, the consequences for the crew and any other road-users in the vicinity at the time could have been devastating. "We could have had a different story coming out here this morning, life could have been lost."